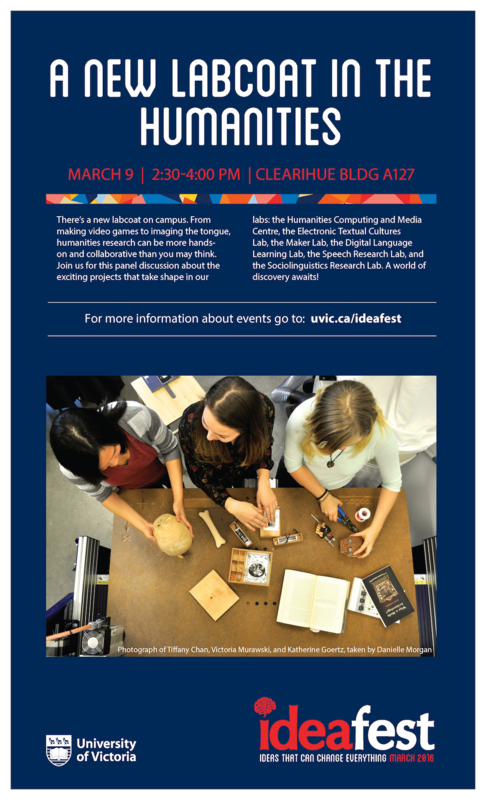 Tomorrow (Wednesday, March 9th)—with colleagues from the Humanities Computing and Media Centre, the Electronic Textual Cultures Lab, the Digital Language Learning Lab, the Speech Research Lab, and the Sociolinguistics Research Lab—I’ll be presenting during “A New Labcoat in the Humanities,” an IdeaFest 2016 event scheduled for 2:30-4:00pm on the UVic campus. A brief description of the panel, as well as a poster, are below. Hope to see you there! Post by Jentery Sayers, attached to the Makerspace project, with the news tag. Featured images care of IdeaFest 2016 at UVic.